HTI’s insulation addresses aspects of safety where other products have fallen short. Similar products have been used in the mining industry to prevent coal dust explosions in underground mining operations. 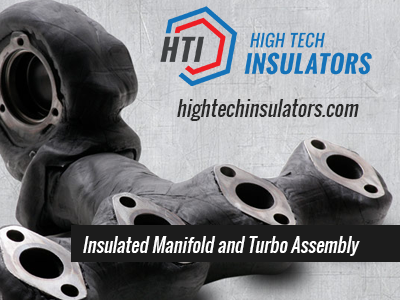 HTI’s insulation covers the exhaust components including the turbo housing and manifold and improves all aspects of safety while reducing long-term costs. Reducing Skin Temperature – Typical diesel exhaust gasses run at about 1100 deg F. HTI’s product will reduce skin temperature to below 300 deg F thus mitigating the coal dust flash point. Improving Durability, Avoiding Costly Fines – HTI’s product is water and fuel resistant. Similar products deteriorate after a few power washings and are no longer compliant with safety regulations thus incurring fines. Improving Service Safety – HTI’s product cools quickly and vastly decreases the likelihood of a mechanic sustaining a burn. HTI’s product is well suited for the mining industry as well as marine and military applications. For further information contact Adam Allen or visit www.hightechinsulators.com.